Growing up in suburban Wisconsin, Bernardine Dohrn was a smart cheerleader in high school who went on to get her law degree amidst the political turbulence of late 1960s Chicago. 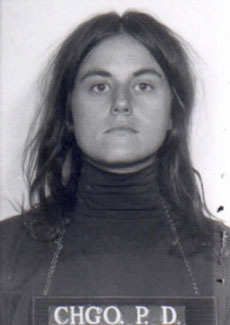 Active with the SDS, Dohrn played a very public role in the student group's dissolution and subsequent takeover by The Weatherman (Weather Underground, but most often referred to as the Weathermen) faction. As the photogenic spokesperson for The Weathermen, Dohrn advocated the violent overthrow of the pigs and was involved with several of the group's bombings of government buildings during the early 1970s. Living underground as a fugitive in San Francisco and Chicago for 11 years, she and her husband turned themselves in by 1980. Federal charges for conspiracy to bomb buildings had been dropped due to illegal evidence gathering by J. Edgar Hoover's COINTELPRO-style infiltration of the Weathermen organization. Dohrn got away with it all, paying a $1500 fine for a minor bail-jumping offense and later doing a little time for refusing to testify against a cohort, Kathy Boudin. Dohrn's adopted son Chesa is the biological son of Boudin, incarcerated for armed robbery when the child was 14 months old. Dohrn has spent the last few decades as a lawyer and currently teaches classes on children's legal rights at Northwestern University. "Dig it! Manson killed those pigs, then they ate dinner in the same room with them, then they shoved a fork into a victim's stomach." -- Bernardine Dohrn on the Tate/LaBianca murders, 1969. Widely reported to be Milwaukee, WI -- her FBI record says Chicago.